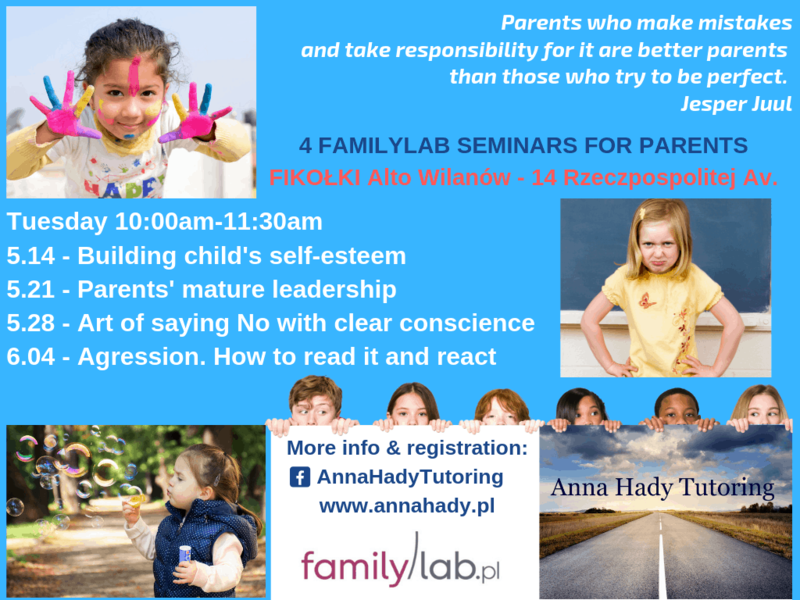 Anna Hady offers Growth Tutoring and Family Tutoring in Warsaw in English or Polish – individual workshops for parents, parenting seminars as well as growth tutoring sessions. Family Tutoring is addressed to parents of toddlers, preschoolers, schoolers as well as those who wonder “when is it too late for bringing children up”. Are you wondering about the direction you want to give your parenthood? Are you lost in the offered educational methods? Do you want to create a happy family based on shared values with the space for the individuality of each of its members? Are you interested in getting to know yourself better and improving yourself, defining key values, developing talents? Are you searching for the path of education that will be consistent with your talents, and will help you discover and polish them? Are you looking for a career path meeting the expectations of a job that gives you satisfaction and develops your strengths? I have a degree in linguistics, studied sociology, hold Executive MBA degree of Polish Academy of Sciences’ Institute of Economics; I have professional experience in the international business environment holding managerial positions. However, starting a family and bringing my children into the world changed everything. Today, first of all, I am a wife and a mother with all my heart, and also a Tutor. The role of wife and mother has led me to seek answers to questions about building a happy family. Children awake in me an infinite motivation for development, my husband provides extraordinary support in my activities. I was searching for a path of education to be, not only strong, but equally happy and good person aware of their potential and building their character on a strong foundation of values. I believe that Tutoring is such a path and it is worth entering at various stages of one’s life – continuing education, designing life and career path; and planning goals or changes in life. I have completed a first-level tutor course at Collegium Wratislaviense; specialization in Positive Psychology at University of Pennsylvania; certification training for Familylab trainers. Gaining these competences was an extremely valuable experience for me, I continue self-development and undergo trainings to share this knowledge and spread ideas that change the world around me for the better.